We are proud of our diverse client list which includes national associations and professional societies, as well as Fortune 500 corporations and state trade associations. Our work is customized to each client, but revolves around improved performance of the grassroots, PAC and lobbying functions via an emphasis on research-based methods and skill transfer to the client. This is delivered via consultation, coaching, training workshops and keynote speeches, research projects, and materials development. After two days of intense grassroots and PAC leader training, Amy with three of the very best political involvement professionals. 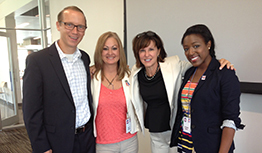 L to R: Chad Wilson, Carol Phillips, Amy and Sophia Davis of Nationwide Insurance. 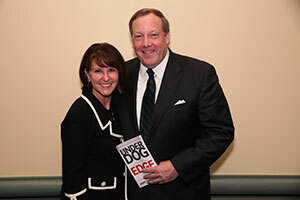 Amy with NCPA Senior Vice President Steve Pfister after her Underdog Edge keynote to his over 1,500 members at the pharmacist’s annual convention.